Almost every website has some sort of pagination mechanism that allows you to load more results from a given initial result page. Typically, the mechanism behind the pagination involves simply a link to the next/previous page. If the link is followed, the next subset of results is displayed, along with another link to the next/previous page. In other cases, a POST request is needed because the server expects heaps of unintelligible parameters and values hidden in the page in order to track the state of a user session. The HtmlPaginator provided by the parser assists in handling the simple and the complex cases. It’s available from every HtmlEntityList and HtmlLinkFollower through the getPaginator() method. Let’s demonstrate how it works. Now we need to configure the parser to visit the next page of results indicated in <a href="page2.html">Next Page</a>. // Give the parser the first page to process. The paginator is built to target live websites but here it is working against files stored locally. You can check the Downloads and historical data management tutorial later to learn more about how to store, organize and reparse HTML. Time to explore a few additional settings that are commonly required to handle pagination in the real world. // Collect rows from up to 2 pages after the first search results page. // Print out the details of the request to be made to the next page. // You can modify the request at will if you need. //this is the request ready to go to the next page. //the context object has additional information. // run the parser against the first page. The paginator will kick in and get the results of another 2 result pages. 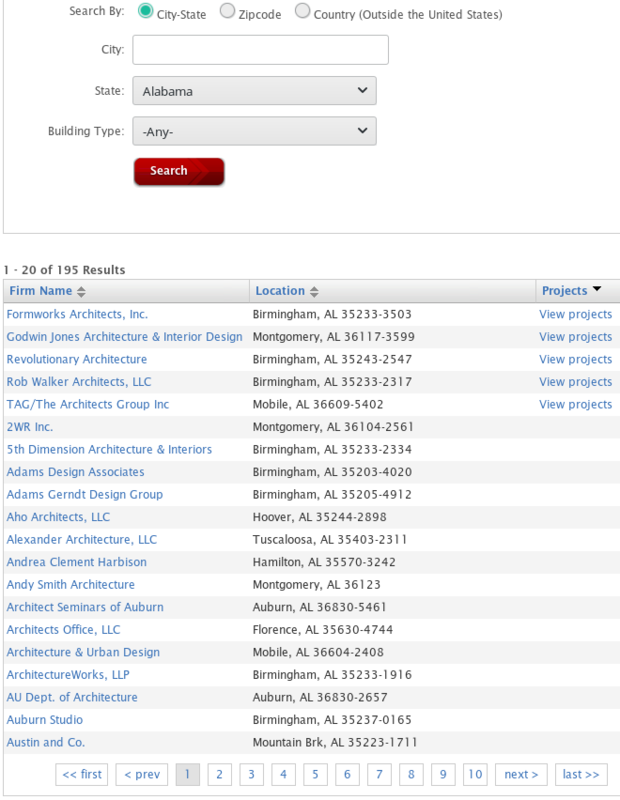 Notice that the headers of the initial request are still used on the subsequent requests for the next page of results. You can add/remove headers or generate a different request altogether from within a NextInputHandler. Here _pgn is the page number and _nkw are the keywords for a search. //update the page number parameter. When the parser collected the results of the first page it called the NextInputHandler for the first time. The URL then got updated from _pgn=1 to _pgn=2. After the handler returned, the paginator “saw” the request was modified and executed it. Once that page of results got processed, it called the handler again. This process continued until the request didn’t change (_pgn was set to 5 and from there it never changed) so the pagination process stopped. REMEMBER The paginator will continue running while the call to the pagination handler modifies the request. Keep this in mind to prevent running infinite pagination loops. You can also use paginator.setFollowCount(); to make the paginator stop. Some websites have their pagination implemented using POST requests. The majority of these contain a <form> in the HTML, and the request for the next page depends on collecting all relevant values from it then submit its values using the POST HTTP method. Rarely there are changes to the URL - it’s only the form that gets updated with new values after each request for the next page. The following example demonstrates how to work with pagination of a website built with ASP.NET. This tutorial should help you to get started but every website will work differently. You’ll have to figure out how to generate proper POST requests by trial and error. Class TutorialAspNet has the full implementation which you can use and adapt for your case. Usually the pagination is controlled using values in a <form> element. One easy approach to get all values of the form is to simply access the target URL with a GET request and extract the form values. Let’s assume you want to get to http://somePageThatUsesAsp.com/frmSearch.aspx. // Open the URL and parse web page into a HTML structure. // Set the data parameters. Our request is ready. // The results come from a table with an ID like "ctl00_ContentPlaceHolder1_grdSearchResult"
// Let's create a partial path that matches this table. // Names are in <a> elements with crazy ID's such as "ctl00_ContentPlaceHolder1_grdSearchResult_ctl02_hpFirmName"
// We use a wildcard to match any <a> in the table, with ID ending with "_hpFirmName"
Finally, we can focus on making the pagination work. Looking at the HTML of the search results, it’s easy to identify that the current page button is highlighted. To go to the next page, we need to reproduce what happens in the browser when the next page button is clicked. 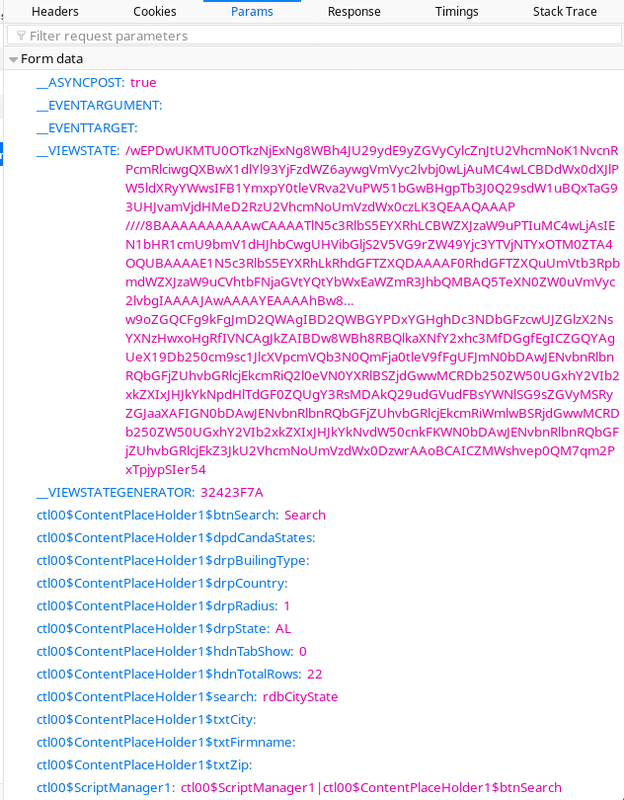 .match("a").attribute("style", "*background-color:#E2E2E2*") // finds the highlighted page - wildcards help a lot. .transform(target-> substringBetween(target, "'", "'")); //we want to get "ctl00$ContentPlaceHolder1$grdSearchResult$ctl23$ctl03"
Now we need to define a pagination handler to configure the POST request. // From that pipe separated string, we need to get the updated value for "__VIEWSTATE"
// The value collected by our field "nextPageTarget" is also required to build the next page request. // These parameters must be removed from the POST request or else the server will return the first page again. // have the same keys and values. To be able to generate the correct request for the next page of results, the pipe-separated response received from the server must be parsed in order to obtain the updated value for __VIEWSTATE. Calling pagination.getCurrentResponse().getContent(); will return the body of the response. In addition pagination.getNextRequest() will return a pre-configured POST request based on the previous response. The data parameters of the previous form will still be there, and any cookies returned in response will be set on this next request object. All we have to do is to update the necessary parameters, and remove what’s not needed. With the code introduced above, the program will now be able to obtain the results and run the pagination without a hitch. Phew! We hope this example gives you a better understanding of what’s involved in processing paginated results where POST requests are required. The solution is always specific to the website and to get things working some patience and trial and error is needed. The key to get things working is to make sure all requests your program generate have the same parameters a browser generates. Use request.printDetails() to compare your requests against what your browser produces. That should have covered everything you need to be able to process paginated results. Let us know if you think anything was left missing. If you haven’t yet, we recommend you to proceed to the following sections (in any order).